Writing (like many things) takes practice. 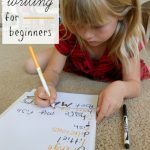 Finding the right writing activities can make that practice so much fun, your kids won’t mind it one bit! 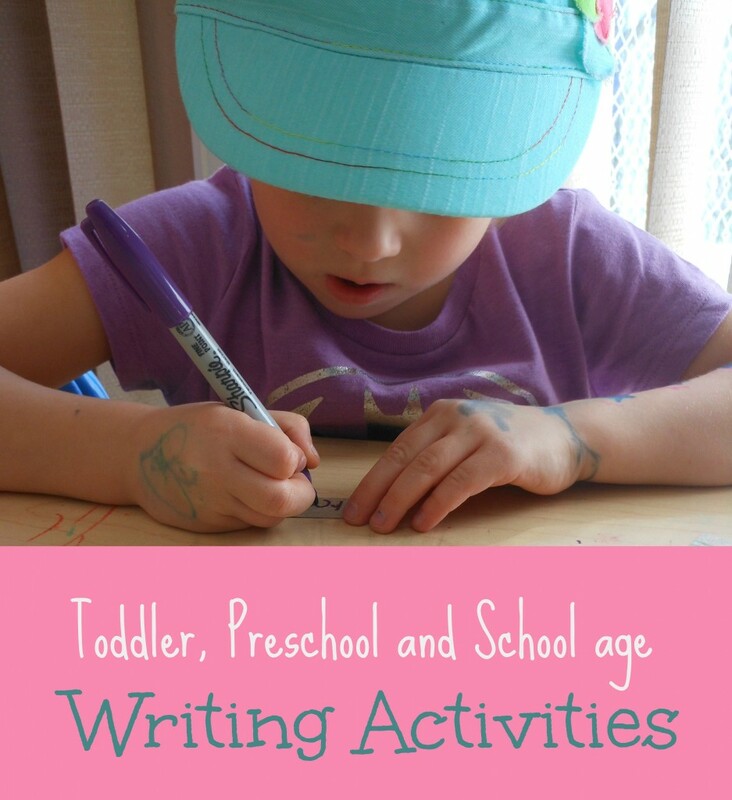 Writing activities for toddlers are all about getting those finger muscles in shape. Preschoolers are starting to learn letters, understand how to hold a pencil and even write some words. By the time kids are in school, getting kids to write for pleasure, write neatly and ummm sometimes quickly is the goal. I searched the web and found 15 great writing activities to get you started. Enjoy! Sensory Writing — Getting used to holding a pencil or make marking with their finger is the first step to writing. Ripping Magazines — Get those little fingers working and make a mess at the same time! Car Track Painting — Help little ones start to understand the motion of writing left to right by drawing a race track and having them roll the car from the left side to the right side of the paper. Sidewalk Chalk on Unusual Surface — Offer writing and marking activities outside by having sidewalk chalk available all the time. Grocery Shopping List — You have to shop, there’s no way around it. Let your kids help by making the list. Use ads with pictures and words to help them write out what you need to buy. Creating Comics with Kids — Nurture Store sets up an invitation to draw by creating a comic strip and leaving most of it blank. Dog Park Adoption Center — Pretend play is the perfect way to allow your little ones to practice writing in a no stress environment. For our dog park I added a clipboard, paper and pencils. The person running the adoption event asked questions and took notes about the future puppy owners. Kids Printable Summer Letters — We are going to use these printables as a thank you for friends who hosted us on our vacation! Fingerprint Matching Game — This is a great reason to give your little one practice writing family members’ names. Book Reports — Especially great for kids who love to read. You’ll find 6 printable book report templates. Family Mail Center — Great idea for encouraging writing as well as connecting with other members of the family! DIY Dry Erase Board — 4 ways to use a dry erase board for writing fun. 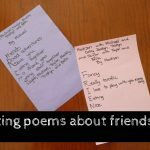 Learning through Stamps — Check out how Highhill Education uses to stamps make a journal type scrapbook. Story Machines — This fun, unique way to write a story will have even the most reluctant writers begging for a pencil! Do you have a favorite writing activity? Tell us about it in the comments! This post originally appeared July 9, 2013. Along the same lines,, Just wondering what the age range is on this…….My son will be 3 next month, and his most comfortable grip is to fist it. Other times he will grip it propertly. The daycare provider has pointed it out to me, and I don’t know if she’s just comparing his writing abilities to the other kids in the daycare, or if this really is a normal range of when he will grasp it the right way, every time? His daycare provider has said that it’s best to get him into the habit at an earlier age, so that it doesn’t become some hard habit to break. She said that kids that learn to write sooner learn to read sooner (and the idea is that learning to hold a pencil the proper way sooner will….leads to a child that write sooner….and reads sooner….you get the idea. Just don’t know how much to push the idea, because I don’t want him to rebel again it and get turned off by writing activities. (P.S. I posted this question in “Toddlers and Preschoolers” but didn’t get many answers. Hoping to get more input if posted in Genenal Parenting). There are links to writing ideas for all ages and you could probably go between toddler and preschooler for your 3 year old. With my kids I really worked on offering a lot of opportunities to use fine motor muscles (or finger muscles). There are so many ways to encourage play with those muscles that don’t even involve a pencil. Play dough, cutting, coloring, buttoning, snapping, puzzles, using tweezers… all of those things will make his finger muscles strong for when he’s ready to write with a pencil. I am all for low pressure learning. What you might try if your concerned about his pencil grip is commenting when he hold it right. Talk about if that is comfortable, how it slides on the paper easily. Positive reinforcement might get him checking it on his own. Let me know if you want me to look into more info for you, or put the question on my Facebook page… I have a lot of really awesome teachers and early childhood professionals there! I like these ideas. I think I will try the comic strip idea out first. I really liked your ideas, they are very great!!! Definitely i will implement them this preschool year. I look forward for more informative ideas! !